Running the sand at Dogfish Hermann CX. Dogfish Hermann CX: I wasn’t as fit as I hoped, but I didn’t have any mechanicals. Jeff Yeilding put a great course and well run event together. My brother David hopped the train from KC to Hermann for the weekend, rode the 1 mile to the race course and joined me camping out Saturday after our races. He did well in his first CX races. We had lots of fun and I hope set the pattern for fun “brother’s CX weekends” in the future. This weekend is a “DO NOT MISS” racing weekend. Manion’s CX Day 1: With the wife and kids out of town I jumped in the car and drove over to KC to see my rents. I got to watch David win the Jrs race and then I finished in the top 10 of the Open Men’s race. (PRO) Joe Schmalz cleaned up on the day. BUT, unlike the last CX race against him, I did not get lapped. That’s some real progress! I was pleased with my result considering I only had 1 functioning brake (my own fault) and that really limited my ability to hit the downhill, dusty, switchbacks. 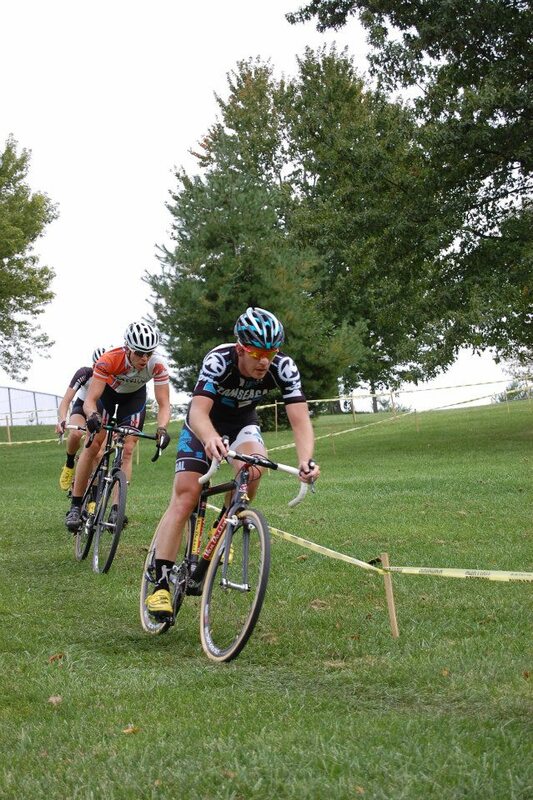 WTB LaVista CX: I showed up 30 min before this race and managed a decent finish (6th) in the Open race. It was an encouraging day as some of the guys I gauge myself off of (Scott and Aaron) were both behind me. They usually finish ahead of me! Teammate BJ throwin down in the mud at Gateway CX Cup with Scott. Gateway Cross Cup: This was the CX season goal. The timing was early enough that some road season fitness would still make me fast. The course was a “grass crit” supposedly. I registered early enough to get a start in the first 2 rows. Things looked good until I got caught behind schedule at work with a project. I showed up when everyone was already in the start grid! I sprinted to the start (without checking tire pressure) and arrived just as they blew the whistle! Marin and Mark let me jump in (I preregistered) and started chasing (with zero warmup – yay!). I made contact with the pack at the big barriers, then completely biffed my remount. I mean, thigh meets saddle then drop onto the rear wheel. I take a deep breath and then do it again. When I finally mount the dang bicycle the chain has fallen under the chain keeper. Fight the chain for a minute and I completely switch gears mentally. With some help from Jim Klages, I get the chain on and start chasing. In the next couple laps my shifting gets gummed up with mud (it was super muddy) and then I flat my rear tubular. Then I got pulled. What an exciting story. COMO Awesomo: Columbia, MO hosted a midstate CX race which provided an opportunity for David and I to race and my folks to see their grandkids. David struggled with tired legs from soccer and finished near the back of the cat 4 men’s field. Nonetheless, as a first year junior, I think he’s doing just fine. I lined up in the open men’s with Dan Miller and Butthead. BJ and I thought the plan would be to hold Butthead’s wheel as long as possible. The first couple laps were good for me but I felt flat and lost contact with Dan and Josh. I started bleeding (stop me if you’ve heard this one) but then rebounded at the end to finish 3rd. Josh and several other guys DNF’d for various reasons. I definitely had a hard time focusing throughout the entire 60 minutes, but that’s why I do this sport, to train that weakness. BJ finished 4th and we both smoked our legs for the next day. 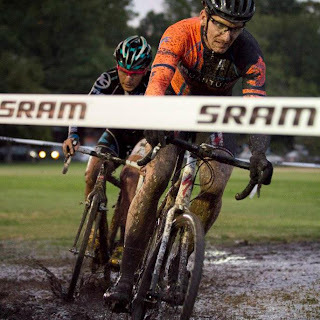 Photo Cred: WTB Superprestige CX. WTB Gordon Moore Park #1: After COMO I didn’t expect to be able to make it to GMP. I’m glad I was able to – it is a fantastic venue. We are very fortunate we get to race there. WTB put together a great track for cyclocross. I ran a rear tubular which I glued myself (first time I’ve ever glued a tubular). Made the chase group selection until I caught my shifter on a stake and opened a gap to the other 5 dudes. That was all she wrote as I checked out for a while. Aaron and Clefcam were soon on my six and I was determined not to let Aaron attack me during the catch (like he did at Hermann!). I slotted onto Clefcam’s wheel and soon realized that he was in the master’s class and might not race against Aaron, so I got on Aaron’s wheel and was starting to get ready for the 2nd wind. Remounting after the barriers I snapped my chain and that was that. I felt like I was driving the course well and I didn’t blow up, though the CoMo race hadn’t left me with fresh legs, I was ok. But man is it rotten to end a race like that – instant death as it were. Once again, the guys in my peer group (Aaron and Scott) finished top 6, so I think if I rode like I was going, I’d be solidly in the top ten. Veldrijden Columbia: After that really fun (but expensive! Flatted tubie, broken chain, y'know, stuff...) block of cyclocross racing, I’m ready to put together the course for this weekend’s cross race in Columbia, IL. I purposely have not replaced the chain on the CX bike so I would not put riding above race prep. (I also took my road bike out of commission – the only way to assure I won’t ride. Lol.) After a few days of trimming back in the single track areas, I think the course is ready. The city recently mowed and temps and precip are settling in to be just about perfect! You using Stans in them tubies? Your Gateway story reminds me of a motorcross video Dornik showed me once. "I got a good start, crashed, crashed, broke my thumb, quit."